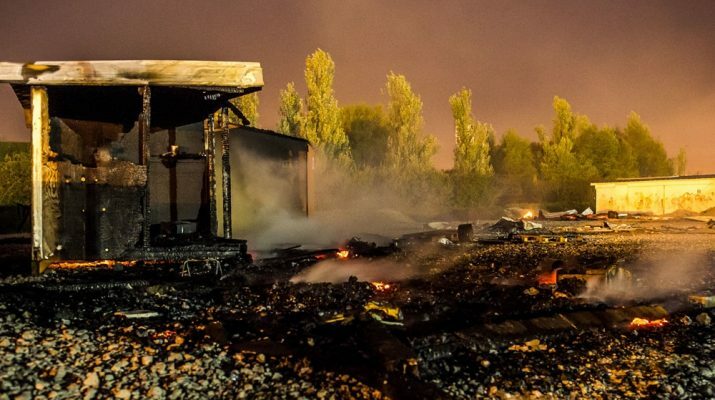 Fire ravages migrant camp near Dunkirk’s Grande-Synthe – Kenyatta University TV (KUTV). All Rights Reserved. A huge fire, apparently started deliberately, reduced the Grande-Synthe migrant camp near the northern French city of Dunkirk, to “a heap of ashes”, according to officials. Firefighters said at least 10 people had been injured in the blaze at the camp late on Monday, which was home to some 1,500 people, mostly Iraqi Kurds, living in closely packed wooden huts. “There is nothing left but a heap of ashes,” Michel Lalande, prefect of France’s Nord region, said at the scene as firefighters continued to battle the flames which were visible from several kilometres away. The camp was being evacuated and the migrants would be rehoused in emergency accommodation, the prefect said, adding that the Dunkirk suburb of Grande-Synthe had already made two gymnasiums available. “There must have been fires deliberately set in several different places,” said Olivier Caremelle, chief of staff of Grande-Synthe Mayor Damien Careme, an environmentalist who supported the building of the camp last year. “It is not possible otherwise. It seems that it is related to fights between Iraqis and Afghans.” Fights between the migrants continued after midnight, with riot police struggling to contain them and occasionally being pelted with stones. “No one is able to explain how these events could have happened,” said Lalande. The population of the Grande-Synthe camp has swelled since the destruction last October of the squalid “Jungle” camp near Calais, about 40km away. According to several witnesses, disagreements arose after an increase in the number of Afghans who arrived from the “Jungle” camp. Their arrival had increased tensions, according to Caremelle. There have been several violent incidents at the Grande-Synthe camp, with police intervening last month after five men were injured in a fight. Another man was stabbed in November.